You may enjoy hazelnuts as an afternoon snack, which is great, as they’re packed with vitamins, proteins and good fats. Those fats can also be pressed from the nuts to create hazelnut oil, which has wonderful benefits for the skin. Not only is hazelnut oil moisturizing, as you might expect, but it also has a reputation as being a good oil for oily skin, since its natural properties help balance oils. Hazelnuts are naturally hydrating, but their unique makeup produces an oil that helps unclog pores. Hazelnuts come from the Hazel (Corylus) tree, and are also called “cobnuts” or “filbert nuts.” The tree is native to the Northern Hemisphere, has rounded leaves with serrated edges, and very small pale yellow or red flowers that bloom in spring. The nuts themselves grow on the trees in husks, then fall out when ripe, about 7-8 months after pollination. The kernel is edible in many ways—raw, roasted, minced, sliced, powdered, or ground into a paste. Hazelnuts are used to make praline, Frangelico liqueur, hazelnut butter, and pastes (like Nutella), and are often added to candies and truffles. The oil is also used for cooking. Nuts in general are considered healthy because they contain a healthy combination of natural fats. Hazelnuts, in particular, are good sources of protein, vitamin E and B, and a type of mono-unsaturated fat called “oleic acid” that is thought to help lower cholesterol levels. They’re also a good source of dietary fiber, which can promote healthy digestion, and deliver about a third of the daily requirement for folate in one serving, which is important for women of childbearing age. Because of its high vitamin E content, hazelnut oil is slow to go rancid, as the antioxidant protection of the vitamin E preserves it. It has a high level of flavonoids, which are natural plant components that offer a protective benefit. In a recent study published in the New England Journal of Medicine, those participants who ate more than an ounce a day of hazelnuts, walnuts and almonds had up a 30 percent reduced risk of heart attack and stroke. 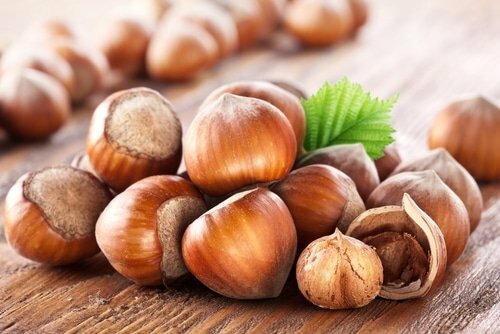 Hazelnut oil has been used for oily skin and minimizing the size of pores because of its unique properties. A high content of catechins and tannins (healthy flavonoids) make this oil a “dry” oil that feels smooth and toning on the skin. Its properties help balance oils and make your pores appear smaller. Hydrating: Even though the oil helps absorb and balance oil), it also has a lot of natural fats that help moisturize the skin, leaving it soft and plump, while helping to reduce the appearance of fine lines and wrinkles. Yet it never feels greasy. Antioxidant protection: Wearing natural antioxidants like hazelnut oil can give your skin the extra protection it needs from environmental stressors. Color-retaining: Hazelnut has been used in many hair care formulas to help preserve color for a longer period of time. The oil also helps strengthen and condition the hair strands, so they can recover from chemical treatments. Gentle: Hazelnut is perfect for sensitive skin, as it is a gentle oil that is unlikely to irritate. Rejuvenating: Because of all the nutrients, flavonoids, and antioxidants, hazelnut can rejuvenate your look. Over time, regular use will help your skin appear more youthful and vibrant. We’ve added hazelnut oil to our Oil for Oily Skin to help. Plus, you get the antioxidant, moisturizing, and protecting benefits along with the deal. Try it and let us know what you think. Do you enjoy hazelnuts in your daily diet, or in aromatherapy or massage therapy? Please share your tips. Ramón Estruch, et al., “Primary Prevention of Cardiovascular Disease with a Mediterranean Diet,” New England Journal of Medicine, 2013; 130225030008006 DOI: 10.1056/NEJMoa1200303. I love how hazelnut oil feels on my skin. I made my own foundation and cream, using hazelnut oil as the base. My skin looks radiant and feels so soft. Thank you for sharing the benefits of this lesser known oil!! I was drinking a glass of Frangelico and trying to look up how it is made, when I found this, ended up using it as a toner lol I did wash it off as sticky but WOW. skin so soft the next day and still smell yummy.